The question is, will we get it? Or will Honda follow Mazda and Ford in replacing their subcompact hatchback with an SUV? The HR-V is already here and now offered for 2019 in multiple trim levels and with lower-cost FWD. The basic designs of most Hondas aren’t bad but the details like the chrome brow grille and boomerang claw taillights ruin what could have been nice cars. The previous generation was a really nice example of beautyfull design in a small car. I think was a joined work between japan and Italy as in the 1994 gen.civic and in the s2000 that was designed by Pininfarina. One of the few subcompact that was able to catch the aye (in a good way). The eg-like shape fitted smooth and elegant curbes in a rational mono-volume body. This must be the returning to the old path interrupted by the poor current generation. This is looking promising. I don't mind the current Fit, but the last one had better proportions. I like seeing the rear glass bubble and new green house pillars. Not just a small refresh. The front looks pretty ambiguous now, almost Toyota-ish, but I really like Honda's current upright-grille treatment (besides whether it's chrome or not). Hope that continues. 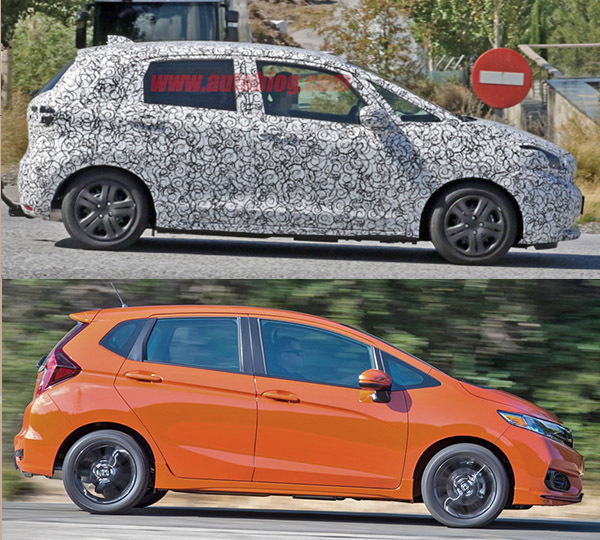 Does Honda sell the Fit in Europe? Maybe the nose bluntness is needed for that pedestrian impact rule? Because the new one has a much blunter nose than the current one. Honda car design are turning rather ugly looking. First Lexus started with their spindle oversized front end, Toyota with the open black oval open front end and now Honda with its unsymmetrical body language. Do any of the new Japanese car designers go to design school? The Koreans are the one now creating the good looking cars now in the Far East. As always, the German in the luxury brands are #1. The Americans are in between in styling. No really attractive but not ugly either.